USA – JUST ANNOUNCED – June 1 – 2, 2019 Dr Melillo will be doing the Advanced Clinical Cases Course and Review for the most advanced professionals. This course will also be a great review module for those professionals who will be taking the next Fellowship testing dates in August 2019 for their post-graduate degree. This will take place at NUHS in Chicago and will not be taped or live-streamed so please try to attend! Dr Melillo is pleased to announce that he will be launching a new full course in the summer of 2019 with new material and curriculum in Sofia, Bulgaria! The exact dates and details will be announced soon. More details, pricing and schedule will be available soon. Once the course has been completed, healthcare professional may sit for a Fellowship Examination through the International Board of Functional Neurology. For more information visit www.ibfn.org. 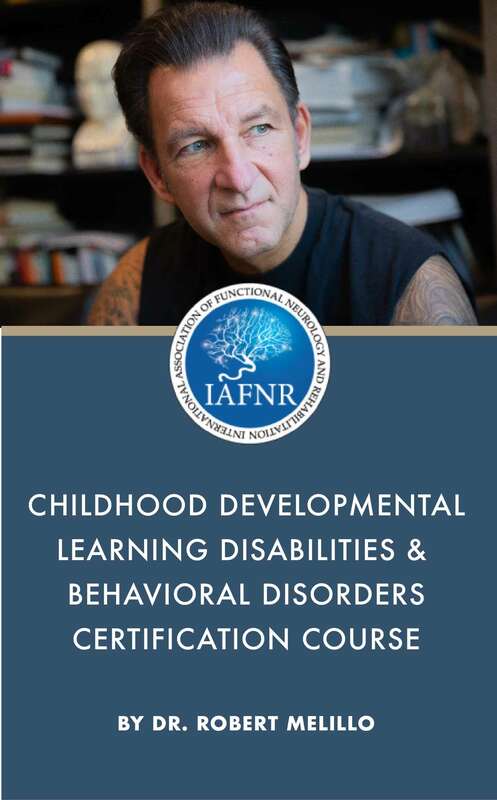 This course is designed to introduce the learner to Hyperkinetic Disorders such as Attention Deficit Hyperactive Disorder, Obsessive Compulsive Disorders and Tourette’s Syndrome. We review comorbidity, epidemiology and prevalence. We review the physical examination of a child and adolescent. We review the motor and sensory milestones in normal child development. We review primitive and postural reflex evaluations and remediation exercises .We will review in detail the neurology of the basal Ganglia and its relationship to hyper and hypokinetic movement and behavior. We review the relationship between direct, indirect and Hyper-direct pathways, dopaminergic pathways and the interaction with the Prefrontal Cortex and the frontal lobe. There will be a practicum where all learners will demonstrate the primitive and postural reflex tests and the remediation exercises. We will also present various live and videotaped cases of children with ADHD, OCD, Tourette’s and discuss as a group the various treatment options. In this course we review the increasing prevalence of Autism Spectrum Disorders, including Autism, Asperger’s, and PDD and other disorders that make up Autism Spectrum Disorders. We review the use of the DSM IV of the diagnostic criteria including behavioral checklists and history. We discuss in detail the concepts of epigenetics and environmental factors and their role in ASD. We discuss the idea of genetic predisposition and an Autism trait and how this relates to cognitive style and hemispheric dominance. We discuss functional disconnection syndrome and its relationship to the symptoms of Autistic Spectrum Disorder. We discuss the use of sensory, motor and cognitive based stimulation to remediate ASD. We also discuss the role of the insula cortex and its effect of smell, taste and interoception and metacognition. We will conduct a practicum with demonstration and review of all primitive and postural reflex testing and remediation exercises as they specifically relate to Autistic Spectrum disorders. We also do a specific hands on protocol for dealing with very young, and or low functioning children. We discuss other treatments and theories of autism and an extensive review of the literature. We will also present various live and video taped cases of autistic children and discuss as a group the various treatment options. In this course we discuss the epidemiology, prevalence and neurophysiology of Dyslexia, reading disorders, processing disorders and Learning Disabilities. We especially focus on the evolution, development, neurophysiology and function of the cerebellum and brain stem. We review the various theories of Dyslexia and treatment approaches. We review the relationship of Dyslexia to left hemisphere function and dysfunction. We discuss the relationship between the dorsal and ventral cortical systems for vision and hearing. We discuss the use of light and sound therapeutically and the relationship of the right and left hemisphere in word reading vs reading compensation. We review standardized testing .We conduct a practicum where we review specific primitive and postural reflexes that are believed to be associated with Dyslexia and learning disabilities. Most importantly we will conduct a specific hands on practicum know as Learning Disabilities Simulation Training. In this practicum we will take several members of the class and have them take part in various activities that will literally allow them to experience first hand what it feels like to have various disabilities such as dyslexia, auditory and visual processing disorders, sensory tactile deficits, visual – motor integration problems etc. We will use this also to reinforce the major issues and disabilities that are addressed in schools and in education. All together this Learning Disabilities Simulation is one of the most powerful experiences learners will ever experience in this area and it is one they will never forget. We will also present various live and videotaped cases of Dyslexic and learning disabled children and discuss as a group the various treatment options. In this course we review basic dietary needs and normal growth and development al charts. We discuss the evolutionary development of human diet and digestive function and its relationship to brain growth. We review neurophysiology of the taste, smell, digestive systems. We also review the neurophysiology of the autonomic and enteric nervous system and their relationship to central neurological control mechanisms. We discuss the use of standardized blood testing and a basic review of immunology. We discuss the role of lymphocytes and the difference between Th-1 or T cell and Th-2 or B cell mediated immune responses. We discuss the differences between the five types of human antibodies and their role in various types of food and chemical sensitivities. We discuss cytokines and their role in inflammation. We discuss the stress response and the relationship to the hypothalamic, pituitary and adrenal access. We review detoxification pathways. We discuss food aversions, gut dysfunction and dybiosis and the relationship between right and left hemisphere regulation of gut and interoceptive function. We discuss food elimination diets and food challenges. We review the testing and use of various vitamin, mineral, and amino acid supplements in neurobehavioral disorders. We will discuss in detail PANDAS, PANS and the neuro-immunolgy, diagnosis and treatment of these disorders and their relationship to hemispheric development. We will also present various live and videotaped cases of autistic children and discuss as a group the various treatment options. We will describe in detail the neurology of behavior, emotion, attachment and personality development. The learner will also personally experience powerful personal positive psychology principles and motivational techniques to use personally and professionally. This will be a life changing experience for all participants. MODULE 7: COURSE REVIEW: HOW TO PUT TOGETHER A PROGRAM, A PRACTICE AND AN AT HOME PROGRAM. In this module, we will do a complete course review of the modules. In addition, we will discuss how to incorporate all of these tools into a program for your patients and how to develop a new stream of income. We will also do a course review for attendees who wish to continue with the certification testing and fellowship examination. Continuing Education credits are available for Diplomate Renewals through National University of Health Sciences.